So I was suppose to blog yesterday... but I didn't... so here I am today, getting it done. No MORE procrastination! As many of you know the past few years i have picked a word for the year. This process is called "One Little Word", and came about from a wonderfully amazingly talented woman Ali Edwards. You can read more about the projects on her blog. She offers a year long workshop, which is amazing! I have loved it! This will be my second year doing the workshop, and it is so worth it. Anyway, this years word was very hard to come by, I thought about it for MONTHS. I needed a word that was going to help me get back to a point that I could flourish again (flourish was my word f or 2013, and it was great, but I lost my ability to flourish somewhere along the way). There was so much in my head, and nothing was coming up as THE word. I made lists and lists and lists, I would get there, and then cross everything off and start again. I finally decided on a word that could encompass many of my words, but it took me a while to share it, because it felt really selfish. The word I chose was "MORE". It took a while for me to be able to explain why that was my word, and I am still kind of learning why. I want more of a lot of things right now, I want more shenanigans, more devotion, more creativity, to be more conscious, more happiness, to complete more and be more complete, more sharing, more learning, more loveliness, more purpose, more community, and more abundance, just to name a few. And the reason I want more, is because I am worth more. I've been in a pretty bad depression lately because I have felt worthless, and I'm hoping telling myself I am worth more, and having more to work towards will help me get to the other side of this depression. Anyway, On to the pretty stuff. I got to work on some of this month's prompt. I still need to finish up some of it, but I love what I have so far. I decided to incorporate my one little word into project life this year, to help give myself momentum on both projects. Here is what I've got. The top left card says "Hello There More One Little Word 2014", the top right card is a definition and thesaurus entry. 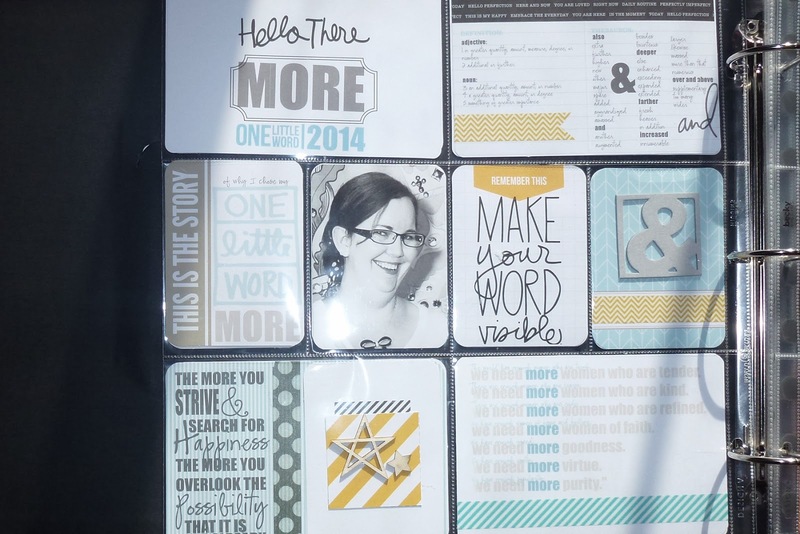 The middle row has a fold out journaling card, with a bit more about why I chose my word, then a photo of me (thank you Disney photopass photographers for getting at least one good shot of me! ), the "make your word visible" graphic that Ali shared as part of the workshop, and a little card with an Ampersand. I choose an ampersand as a symbol for my word this year, as one of the synonyms for more is "and". The bottom row has two quotes that contain my word. I really love how it turned out! It has me excited to continue! I've got a second "Intentions" page I am still working on that will be opposite this page. I also picked up some little wooden letters that I covered with Washi tape that spell out "MORE". My intent is to put them on a wall, and each month add a quote that corresponds with what I want from my word that month on the wall as well. It's my way of trying to "Make My Word Visible". So there you have it folks! A new blog post, a new word, and a new year! You are MORE talented than anyone I know. I hope this year does bring you a lot more happiness and abundance. I love your pages! :) Thanks for stopping by my blog (http://table-for-five.com) I'm off to check out that website now. Thanks Michelle! I need to get the rest of the stuff I have done up! This year's OLW has been so life changing! I don't know how the next eight months are going to top the first 4!